In hunting, there has been a variety of innovation which has completely changed the industry. Some of these innovations include the creation of carbon arrows, scent elimination technology, and just overall design changed to hunting tools that allow them to perform with more power and precision than ever before. 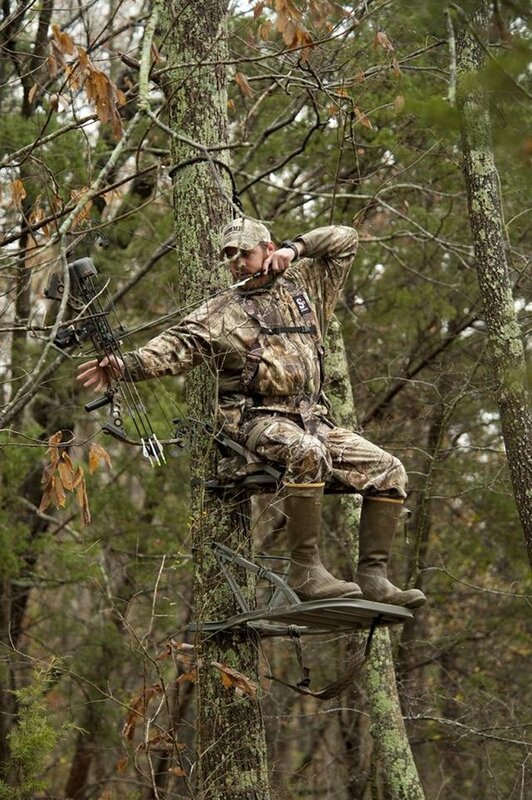 But perhaps the biggest revolution that has come to the bow hunting industry is the climbing tree stand. A good vantage point is one of the most important parts of a successful hunt. 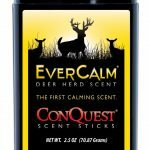 It keeps you away from the deer’s’ line of sight and the best tree stands will ensure that the animal doesn’t smell you very well either. Now although a tree stand isn’t necessarily required, my best hunting trips in terms of ‘take-home’ have included the use of a tree stand. In the following article, I am going to take a look at some of the top tree stands on the market to identify which one is best for you. With safety being at the forefront of all of our reviews, www.taxtactical.com expert ensures the tree stands we include in our best of the list are both comfortable and feature full functionality. Climbing tree stands make it possible for hunters to take advantage of your available hunting time by providing the perfect vantage point. Instead, find a great tree for your climbing tree stand and you’re set for the afternoon. Below we’ll look at some of the best climbing tree stands and what allows them to stand out from the pack. In past articles, we’ve looked at a variety of different tree stands. Although we’ll be looking specifically at climbing tree stands, it’s important to understand the difference between climbing tree stands compared to conventional tree stands. Generally, they’re available in fixed, climbing and ladder styles although there are some slight variations as well. 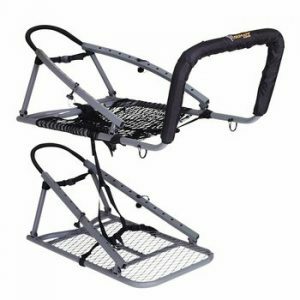 Climber tree stands are a fantastic option for the hunter who’s on the move as you can carry this type of stand comfortably in a backpack. As with any stand though, you’ll need to find a pretty good sized tree to get an optimal view because as you know, not every tree features a straight trunk with no branches in the way. Weighing in at close to 30 pounds, they aren’t necessarily the easiest thing to haul up a tree. But of course, climbing a tree without 30 pounds of added weight isn’t exactly easy either. Climber tree stands do however offer pretty stellar comfort as they come with a top part of seating and a bottom part to rest the legs on. Choosing the right tree is ultimately the biggest challenge as mother nature has given our dear animals a number of defense mechanisms to prevent them from being hunted. Smell is one of the acute factors but obviously, vision is another. Ensure the tree is tall enough so you’re clearly out of eyesight from your prey. Often times hunters will make the mistake of putting the stand only above eye-level of a deer when in practice this can cause deer to flee. Also, you want your tree to provide the right amount of foliage so that you’re not completely in the open. Some brush will obviously assist with your hunt. 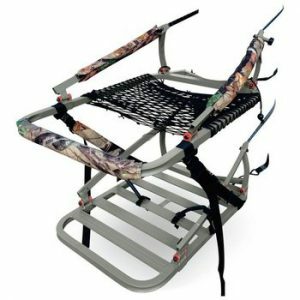 Another nice advantage of the climber tree stand is its advanced mobility. If you’re having trouble finding the perfect tree, you are certainly able to carry it to another part of the woods that might provide more suitable hunting grounds. The best climbing tree stands stand out because they have a number of features that conventional tree stands perhaps don’t offer. First off, climbing tree stands are lightweight and portable. If you plane to trek deep into the woods, there is nothing worse than having to lug around a heavy tree stand. I recommend climbers for anyone who plans to trek their gear and instead recommend conventional tree stands for those who want a stationary stand in their back forty. Second, it allows hunters to be mobile. With hunting with a climbing tree stand, you always have the opportunity to find a tree and instantly get the best vantage point. This is ideal for hunters who are perhaps looking to move around a lot. The final point is that maintenance is essentially non-existent. Because of their design and because they’re in a temporary location, the best climbing tree stands will last you a long time. You won’t have to worry about weathering and in most cases, you don’t have to worry about wear and tear as the tree stands we’ve considered all meet the high-quality standard you’ve come to appreciate. Now you might be wondering how you can climb up a tree with a big tree stand? And how does it attach to a tree anyways? Valid questions and for the sake of your safety, I’ve posted a video below which gives you a good look at how exactly a climbing tree stand works. A climbing tree stand works on the basic principle that it will bind off the trunk of a tree creating a wedge that is essentially held tight by the hunter’s weight. This is another reason why the bigger hunters out there won’t have any problem with tree stands as your weight will actually help you dig in! The binding effect is accomplished by the design that the clamping device which is encircling the trunk is elevated to about a 30-degree angle above the stands framework. The framework of the stand is then at a 90-degree angle which provides the climbing stand two points of contact against the tree at two different angles. This system is what provides a safe resting place for your next kill! One of the more popular climbing tree stands is the Ol Man Multi Vision Steel Tree Climber. One feature that’s particular ideas for those who hate having a safety bar encircling the tree stand. Instead, you can simply adjust the safety bar to where it becomes a footrest instead taking any worry of hitting the safety bar when you release away.The price point of the Ol Man is ideal as it won’t break the bank either. There is actually another option of aluminum which is a little bit lighter but the price is considerably higher. The Ol Man is a ‘no-frills’ type of stand and makes the most of being one of the more quiet options on the market. It’s equipped with the Comfort Tech Mesh Seating which is a very simple and light concept with keeps the weight down. It’s perhaps not the most comfortable tree stand in the world but what can you expect when you’re in the middle of nowhere sitting in a tree! At a weight of about 29 pounds, the Ol’ Man is a little heavier than it’s counterparts although its due in large part to the quality steel construction. It has an overall weight capacity of 3000 lbs. Another great option is the lone wolf sit and climb combo II which has improved upon its original version in a big way, offering a much more comfortable and user-friendly bow hunting climbing tree stand. The first noticeable difference is its extremely thin profile measuring only 4” while in the backpack position. The stand folds nicely away for transport and only weighs 20 pounds which is awesome for those longer trips. The majority of climbing stands you’ll find at the big-box retailers such as Cabela’s are secured to the tree via cables as was shown in the video above. Instead, the Sit and Climb utilize a virtually silent alternative method they refer to as a “traction belt”. From an appearance perspective, it looks similar to an alternator belt in an old sedan but grips the tree very effectively. In some cases, it can even hinder your descent down a tree. Perhaps what makes this unique is the adjustable stabilizer straps. 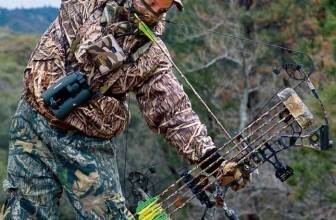 They serve as a multi-functional piece of equipment that allows the hunter to cinch the straps down tight to stabilize the top portion of the stand. It’s super handy and does provide a good level of stability for those who are concerned about it. Perhaps the unique innovation is what the name of this product describes. To use it, you literally sit and climb. It works by making use of the pivoting seat bar, instead of a traditional way of supporting your weight with your forearms while raising the bottom section (think tricep dip!). It’s easy enough and will support anyone up to 250 lbs in weight. A great option for the big and tall hunter we all know. 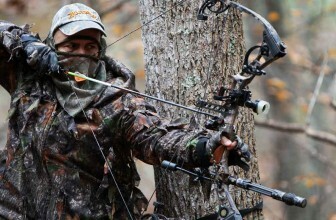 The stand also has a handy built-in bow rack so you can keep those hands warm on colder days. However, you’ll be paying for that warmth as this unit is quite a bit expensive than it’s counterparts as the variety of functionality and comfort allows it to sit at a higher price point. A great mix of quality and performance, the Cobra is one of the lightest climbing trees stands out there. And don’t let the title of ‘Lightest Climbing Tree Stand’ fool you, it still has a reasonable weight capacity although it is perhaps not recommended for those 350 lb hunters reading this review article it’s all good for those hunters up to 300 lbs.With a strong and durable frame, you’ll be able to rein down on the prey below you. It features a nice balance of comfort and features and is ideal for long hunts where you haven’t quite gotten your perfect shot! 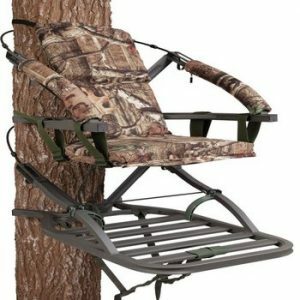 Another nice feature is that the padded seat can be raised and lowered which makes it a bit dual purpose for those who are looking for a climbing tree stand for either bow hunting or gun hunting. Other features include Summit’s patented Rapid Climb Stirrups and a Quick Draw Cable Retention System. Extremely easy to lock on to a ­­­­­tree, just insert the coated cables, pull the trigger and you’re locked in! One feature that we found particularly interesting is the patented Dead Metal sound deadening technology. The idea of it is to prevent any vibrations or echoes that might occur from movements or even something striking the stand (Look out for falling pine cones!!). Because there is nothing worse than having the perfect shot but having a deer hear the scraping of your boots as you line up the perfect shot. 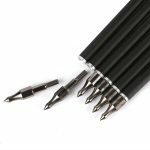 Looking for something on the cheap. Look no further than the option from X-Stand who offer up this beauty. A portable and lightweight option, this tree stand offers the best of both worlds: affordability and fl exibility.You’ll have the ability to set it to the desired height you want easily and quickly so that you have the perfect vantage point for that extra difficult shot. 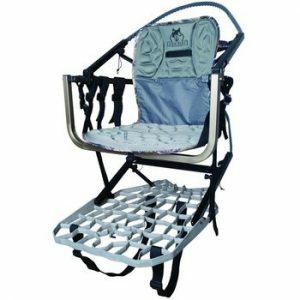 The durable aluminum construction is what gives it its flexibility and weighing it at only 16 pounds, you can run the trails with it on your back if you so choose. Plus, it folds flat and features backpack straps which makes it easy to carry. The drawback here is that IT IS CHEAPER and with that being said, some of the promoted features don’t work as well as they should. So do keep that in mind when you purchase this product as it’s not necessarily the best climbing tree stand; instead, it’s just the best for the money. A couple of things to consider with climber tree stands is that because they are not permanent, they are obviously less stable than their permanent counterparts. It can take some getting used to as there is some sway depending on how you need to position yourself to make the shot so if you are someone who is a little bit… bigger, make sure you’re able to both climb the tree and can maneuver safely once in the stand. If you’re new to the concept of tree stands, do be aware that finding a suitable tree can take time. Remember to be patient as there are lots of trees are suitable but sometimes it can be a bit tricky. Ladder tree stands are as the name implies; built with a ladder. Generally around 15 feet tall, they’re built with a platform featuring a seat that built into the top of the ladder. They are easy to use because you can virtually sit anywhere you can find a tree. Branches and crooked trees, in this case, aren’t nearly as much of a problem in comparison to the climber tree stands. The downside, however, is that these stands can be quite heavy and it generally will take 2 people to put it up in a tree safely. In some cases, used as a permanent tree stand, you’re in some cases best to leave the tree in its original location. One of our favorites and most basic ladder tree stand is the options from Guide Gear. Extremely simple in design, it has all the features you need and nothing you don’t. It features padded seating and armrests for your comfort and is sturdy where you won’t rattle the equipment and scare off your next kill. At 52 lbs, you’re not going to be lugging this ladder tree stand miles through the forest but it’s a great option for those who have hunting opportunities in their own backyard. Fixed position tree stands or otherwise known as hang-on tree stands are a platform featuring a seat that is attached to the tree by either straps, chains or cables. How you get up the tree is ultimately up to you although often times hunters will use screw-in style steps to get up to tree stand. Screw-in style steps are basically heavy-duty screws drilled into the tree creating steps up to the ladder stand. Be careful with these however as they can be damaging to a tree and in some cases can even kill a tree. Another option to reach this type of tree stand is to use a small ladder and abandon the ladder once in position. Much like ladder stands, because of their weight and lack of mobility, they’ll generally be fixed in position. Setting up and move hanging tree stands can be too time-consuming and will require in most cases a couple of people to set-up. Hunting from a tree stand is by far one of the most effective ways to hunt game. The elevated position provides you the best line of sight while your game will never have a clue what hit them. Furthermore, tree branches will provide the natural foliage which is recommended to ensure you remain undetected. There are a few different views as to how high is high enough for a tree stand. I’ve always been on the side that the higher you are in the air the better although that doesn’t necessarily provide accessibility for everyone. Generally, you’ll want your tree stand to be at least 12 feet tall to heights in excess of 20 feet. At the end of the day, it does depend on what you’re comfortable with as not everyone will feel comfortable hanging from a tree at 20 feet attached to a tree with a cable and the power of gravity. My recommendation is to experiment with different heights and see what type of success you have. If you start at maybe 10 feet, and you notice that you’re scared of a few deer, consider raising the platform a couple of feet. Continue to test the height until you’re at a height you feel both comfortable at and a height that doesn’t alert your prey to your presence. Finally, ensure you have the proper bow sight for tree stand hunting. Typically, you’ll want a pendulum style bow sight to ensure you have the best chance of hunting your prey humanely. Final Thought: For many hunters, a climbing tree stand is as much an essential accessory as a bow sight or hunting targets. They allow you to get a much better vantage point on your prey and provide comfort on those cold a blustery afternoons. If you’re like me and would rather wait for your prey to come to you then I highly recommend purchasing a climbing tree stand today.